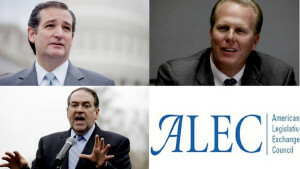 At least three GOP presidential hopefuls are set to appear in San Diego in late July as part of the conservative ALEC annual meeting at downtown’s Manchester Grand Hyatt. Image from change.org petition launched by UC San Diego political activist. Sen. Ted Cruz of Texas, Gov. Scott Walker of Wisconsin and former Arkansas Gov. Mike Huckabee are listed as speakers at the 42nd annual meeting of the American Legislative Exchange Council. Cruz, 44, and Huckabee, 59, have formally announced bids for the Republican nomination. Walker, 47, is expected to join the 14-candidate field in coming weeks. Walker is a former ALEC member. San Diego Mayor Kevin Faulconer also is slated to address the group, which had drawn fire from liberals over its financial backers and role in advancing certain causes. In fact, a petition launched on change.org urges Faulconer to withdraw from the July 21-25 event. Fewer than 60 had signed the petition as of Tuesday night. The group posts its reactions to news at americanlegislator.org. Its critics include the Center for Media and Democracy, which notes what it considers hurtful ALEC activities. Faulconer’s office did not respond to a request for comment on the change.org petition. Elbert Lin, solicitor general in West Virginia and a former law clerk to Supreme Court Justice Clarence Thomas who takes part in Federalist Society events. State Rep. Rick Miller of Texas, a Republican member of the Texas House of Representatives since 2012. He was a naval aviator who later served in the Pentagon. Also set to speak are former Reagan adviser Arthur Laffer, the supply-side economics author, and Travis Brown, a strategist and fundraiser for the Republican Governors Association. Two weeks ago, another GOP hopeful, Sen. Rand Paul of Kentucky, was the main speaker at the San Diego Republican Party’s annual Lincoln Reagan Dinner at the Hilton San Diego Bayfront. Early registration for the ALEC meeting has closed, but members and nonmembers can still sign up for the event. Fees range from $150 for spouses and guests to $1,400 for private sector nonmembers registering on site.